A snowmobile groomed singletrack just for bikers. 25 miles of machine packed snow perfect for rolling your fatbike. Trails are on some of the summer singletrack and some of the old jeep trails that criss-cross the area. One main climb at the beginning and then lots of flowy descents. Even have a berm section to test your snowbike skills on. In addition to the specifically signed and groomed SBR, almost the entire 40 mile singletrack trail system gets heavy use and can be biked through the winter. The non-groomed trails will not be open as soon after a snowfall as the snow-route, but usually within a couple of days bikes can access. 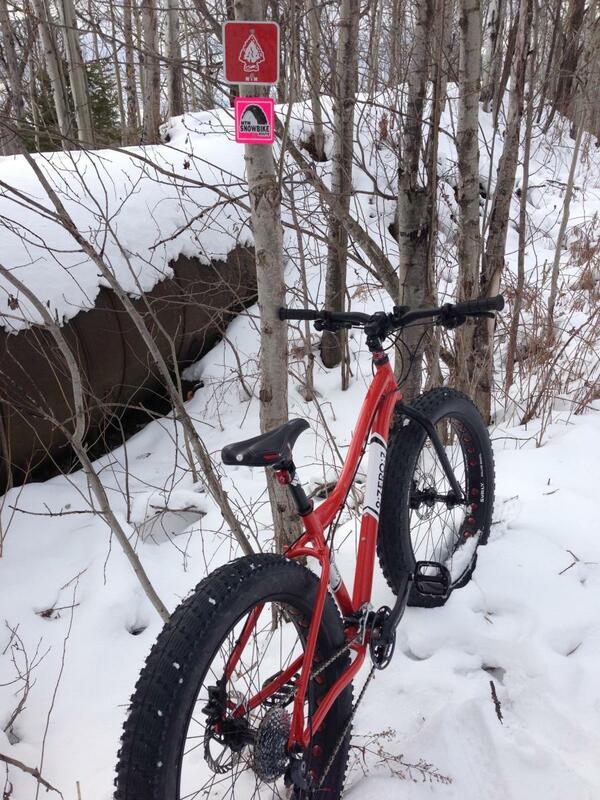 Review: Hands down the best groomed trails in the state for fat bike snow riding. Review: The best groomed snow for fat biking in the state period. Review: I ride the snowbike route (SBR) regularly after work. It has a few long climbs but it pays you back with long bermy downhills. The reflective signs are great for night rides with lights. Highly recommend this trail along with others in the area such as the north trails. Review: The fat bike revolution is right at home on this 12 mile multi loop system of machine groomed carpet. Big climbs and long downhills wind through maple and hemlock stands with views of the city and local ski hill. Make it a goal to ride "freak n nature's" super flowy berms and "greywalls" bridges. There is also a new very fast trail down the south east side of Mt. Marquette but keep in mind that you may need foot packed trails to get you back to the trailhead. Marquette is also packed with other winter time trails that will keep riders stoked for days! Marquette SBR (snow bike route) North plus South MTB Trail 5.00 out of 5 based on 4 ratings. 4 user reviews.